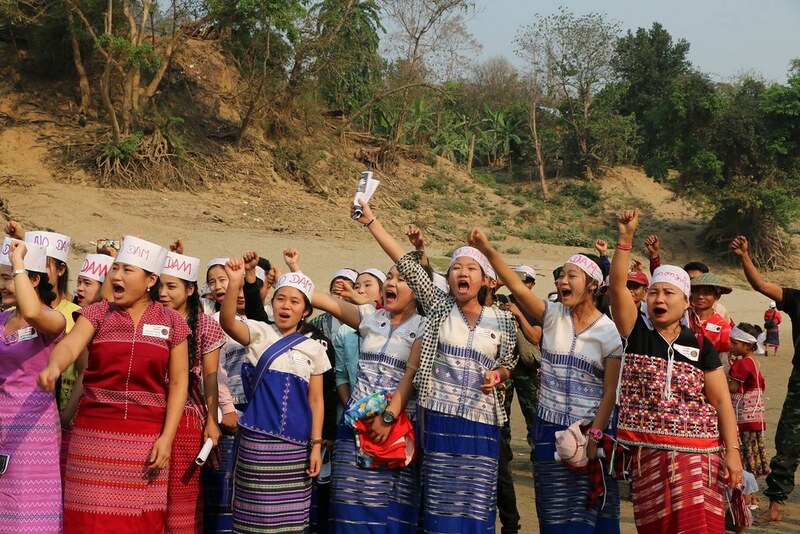 A public rally in Myanmar, where civil society groups assembled for the first time to protect free-flowing rivers and oppose hydropower that is driving conflict and undermining efforts to build a democratic federal union. 300 participants wearing “No Dam” headbands sailed on an industrial ferry along the Ayeyarwady River near Mandalay to mark the International Day of Action for Rivers. A Water Fair in Panama celebrating 15 years of defending the Río Cobre. Community members organized to share experiences, exchange products, and promote organic agriculture and the protection of water resources. The fair provided an opportunity to discuss water issues among the candidates for local, municipal, and national government offices in the May 2019 elections. A protest led by indigenous groups in the Philippines. Indigenous peoples under Katribu, the national alliance of IP organizations, protested in front of the Chinese Embassy and at the main office of the Metropolitan Waterworks and Sewerage System (MWSS) against China-funded mega dams in ancestral territories. A bike marathon in Bangladesh, where young people from over 20 universities across the country got on their bikes and cycled for rivers. Bangladeshi group Riverine People has been organizing the Cycle for Rivers to engage youth and raise awareness about river protection every year on March 14. River clean ups, gatherings, ceremonies, and boat rides in dozens of countries around the world led by local groups — thank you for getting out there and getting your hands in the water! To all of those around the world who joined in on Day of Action for Rivers 2019, thank you for strengthening the movement for rivers and water. Together, we have raised our voices to bring attention to the urgent needs and threats facing our rivers, and stood for hope and solidarity as we find solutions to protect our rivers. Thank you for being a part of the movement - and please join us again next year! #RiversUniteUs! The International Day of Action for Rivers is a day dedicated to solidarity – when diverse communities around the world come together with one voice to say that our rivers matter. That communities having access to clean and flowing water matters. That everyone should have a say in decisions that affect their water and their lives. That it’s our time to stand up for these rights, now more than ever. This year’s Day of Action for Rivers theme is in celebration of the role of women in protecting and managing our rivers. Women are often the primary users of water in their households and communities. Tasked with securing, maintaining, and using water resources in agriculture, fisheries, forest and land management, women sustain life through their relationships to water. Despite this, women are far less represented in decisions about how water and rivers are managed and developed. Deep inequalities persist, with men holding a majority of the decision making power and influence. International Rivers is working to ignite and promote a global movement of women water leaders. This movement will come together for the first time at the Women and Rivers Congress, on March 6th - 10th. We welcome all actions that join us in recognizing and celebrating the role of women in sustaining our waters and life! Planning an action? Register it here. After it’s approved, it will appear on our Actions Map. Use the Day of Action logos posted at the bottom of this page, or create your own art for your action! Post questions, updates, and calls to action on the Day of Action for Rivers Facebook page. Share the page with your friends. Sign up to receive Day of Action for Rivers email updates. Report back! Send photos and descriptions of your actions to dayofaction@internationalrivers.org. The International Day of Action Against Dams and For Rivers, Water and Life was adopted by the participants of the first International Meeting of People Affected by Dams, March 1997 in Curitiba Brazil. Representatives from 20 countries decided that the International Day of Action would take place on March 14 - Brazil's Day of Action Against Large Dams. Our aim on this International Day of Action for Rivers, is to raise our voices in unison against destructive water development projects, reclaim the health of our watersheds, and demand the equitable and sustainable management of our rivers. Read our International Day of Action for Rivers blog to learn more!